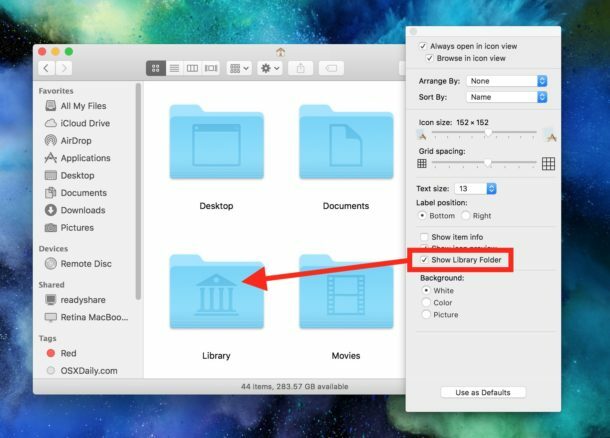 The User Library folder is hidden by default in MacOS Mojave, High Sierra, and macOS Sierra, but some advanced users may wish to show and access the ~/Library/ folder, which contains preference files, caches, and application support data. 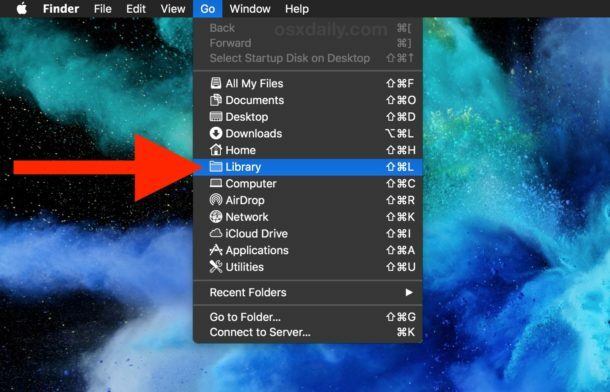 We’ll show you how to access the User Library folder quickly, as well as how to set MacOS Mojave / Sierra Finder to always show the User Library directory. 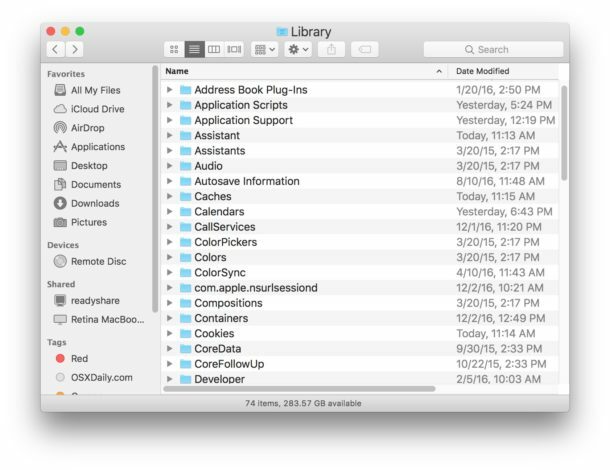 Because the users ~/Library folder contains important data and files for Mac user accounts and apps to function, it’s generally a good idea to leave the directory and its contents alone unless you have ea specific reason to dig around, and know exactly what you’re doing. Casual users have no business in the ~/Library directory. And remember, the system level /Library folder is different from the user level ~/Library. You can also hit Command+Shift+L from the MacOS Finder to immediately jump to the ~/Library directory of the active user account. * Note that in older versions of Mac OS you need to hold down the OPTION key rather than the SHIFT key. This is specific to each user account on the Mac, so if you want to reveal the user account on a different account you’d need to re-enable the same setting individually. Another option is to use the command line to reveal the ~/Library directory, like what was required in Lion when the directory first became invisible to the end user. The above tricks also work to reveal and show the same user ~/Library folder in Mac OS X versions El Capitan and Yosemite (10.11.x and 10.10.x), and presumably forward beyond macOS 10.14.x, 10.13.x, and 10.12.x. Jacque, there’s no way that the SHIFT key shows the Library. Only the OPTION key does that. Shift key actually does.. its weird. usually its Option, but on mine it is now shift. It’s actually a bug in the latest 10.12 build of macOS. For some users the shift key can actually become the key that activates the Library option. How about just using the “invisibliX.app. How about just dragging the Library file (once displayed as above) to the favorites panel on the left of a finder window. That works for me. Your solution/suggestion is so simple. Plus I can ” drag ” and place it were i want. Before Apple added the Finder pref, that was the easiest way to make its display permanent. Option key to display, drag to sidebar. You need to press the option-key to reveal the Library option in the Go-menu, the shift-key does nothing for me. The Shift key reveals Library under Go menu for Sierra, maybe you are on El Capital. It’s option key in El Capitan to reveal Library option – shift key gives you “Select start-up disk on Desktop”. Shift doesn’t work for me. Option (Alt) works. That’s what I’ve always used. I’m on 10.12.1 using a Mac Pro and standard Apple keyboard (A1243). This is weird. SHIFT seems to be working for some, and OPTION/ALT seems to be working for others. I have macOS Sierra and SHIFT did not work for me; I had to use OPTION/ALT. Since the display method appears to be OS X version specific, such howtos should specify which version the author is writing for. Library is hidden for a while now, but “MacOS Sierra” is all over the article. Do you mean version number? 10.12.x is Sierra. I am running 10.12.2 (update installed just yesterday [14 Dec 2016]) and option/alt shows the Library. Command+Shift+L opens Library, Shift key shows Library on Mac 10.12.2 for me. I would just like to confirm, with Sierra 10.2 the shift key did nothing and it was the alt/option key that worked (as with the previous OS’S). I have 2 accounts on my iMac, when I am logged in in one it’s Shift on the other it Alt. I tried trashing Finder Prefs, no change, must be User related though.